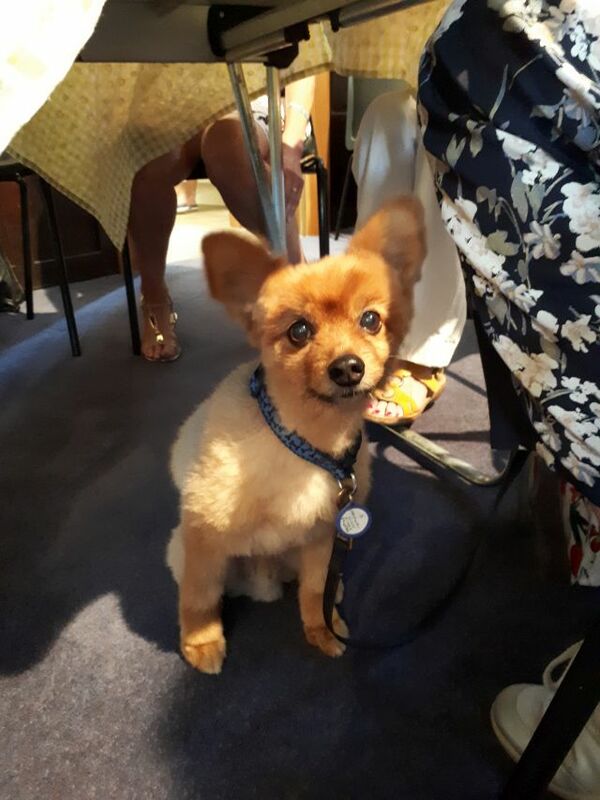 Our subject on this scorching Sunday was The Bible and a large crowd joined us, not to mention some four legged friends who tried out the coolness of the church. We watched a video of how the collection of 66 books formed The Bible and how the New Testament completed the story of the Old Testament. 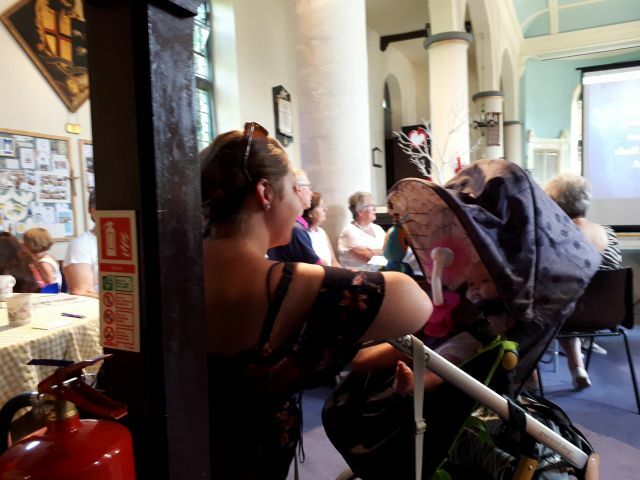 Some told us of their favourite parts and stories and Judith talked of the accessibility of the many different translations and lead our prayers. We finished with The Grace and there were handouts for us to read at home. Our next Cafe Church will be on the 12th August and will complete our topic with a collection for The Bible Society. The subject of Cafe Church today was given to us by one of the congregation, Hymns and Praise. We were pleased to welcome Emily Allen from Church House who is helping us with our planned pew removal. 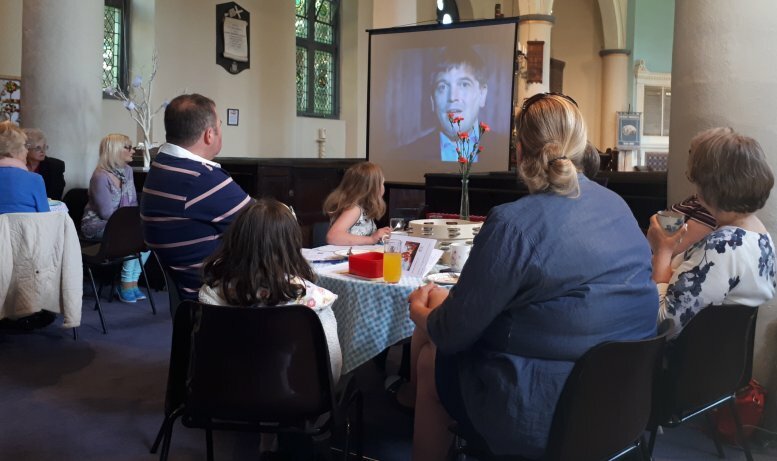 After looking at the Bible’s advice on praise we watched a film on famous quotations, which was well received. The congregation filled in lists of favorite hymns during the interval, which will be used in our service hymn selections and then ‘Named that Hymn’ after just a few notes. Not that easy, though most were identified immediately. 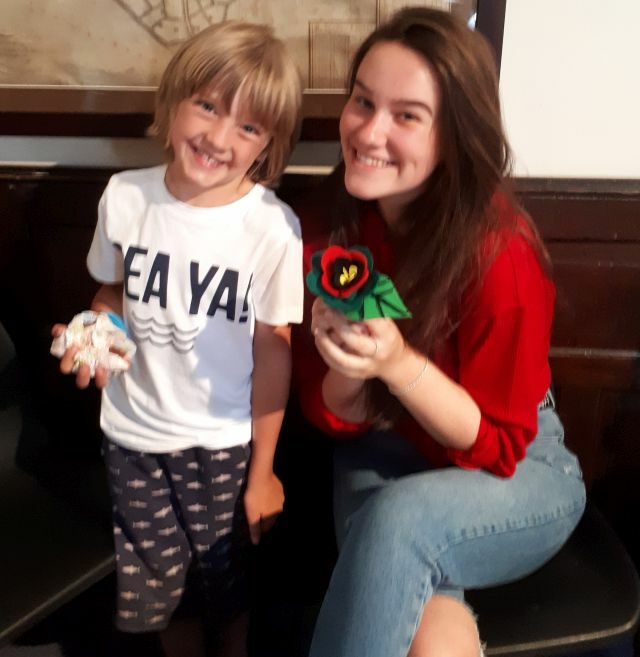 The children were very busy making happy hands and felt flowers as can be seen in the photo of Alfie and Faye. “The Circle of Life” was the theme for our Cafe Church today. We watched an excerpt from Disney’s “The Circle of Life” video to begin with and later we watched a Rico Tyce Video about Jesus’ teaching on how the world’s problems are caused by the problems of the “Human Heart”. People were invited to play a video of their own life, both good and bad, an invitation that was declined by everyone there. Lynn lead us through a prayer asking for God’s forgiveness and offering ourselves to him, before we closed with The Grace. 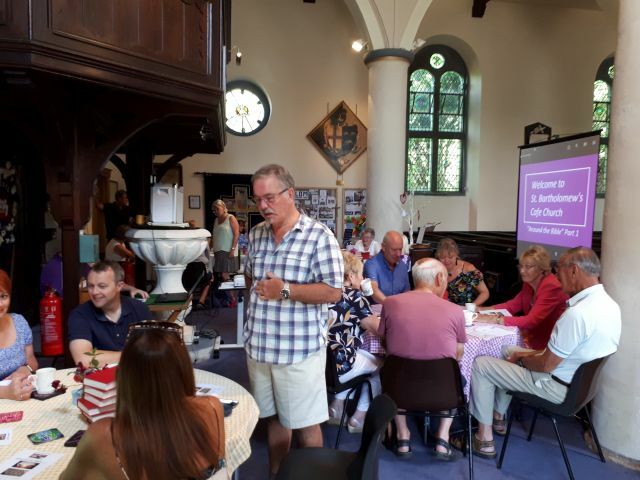 The subject at Cafe Church today was ‘Partnerships’ and the congregation looked at how Jesus partnered the disciples before sending them on missions, a practice Peter and Paul continued in their missionary work. We were asked by Chester Diocese to remember our partnership Diocese in the Congo where there has been recent tribal conflict. During the interval each table looked at successful and unsuccessful partnerships and there was a discussion about the part ‘respect’ played in a successful team. Jack Lakin completed the treasure hunt and won a tub of chocolate coins. The service ended with a blessing on all partnerships, but particularly on two of our regular worshipers, Sue and Roger. Roger produced a ring and gifts for Sue and received a round of applause for the re-affirmation of their commitment to each other. 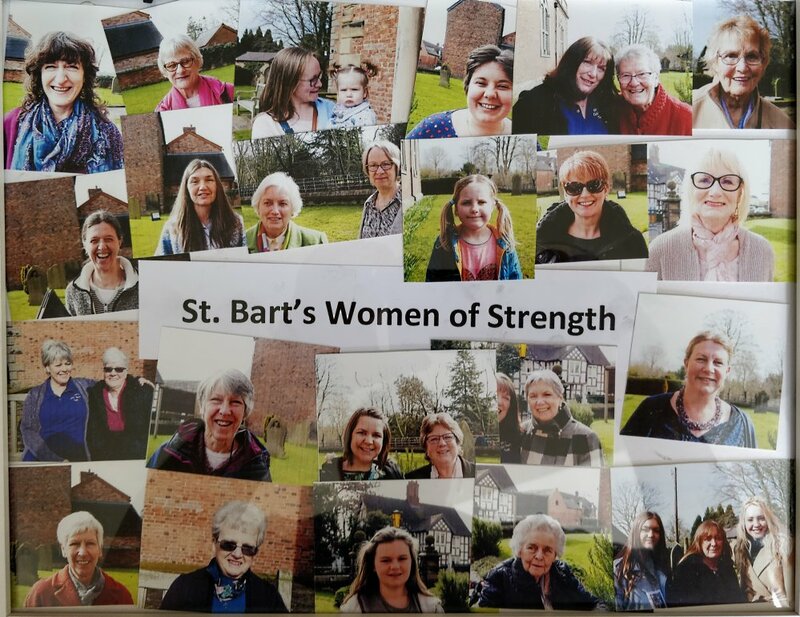 Today in a packed Cafe Church, especially for Mothering Sunday, we looked at women of strength through history. There was a challenge to list the top attributes of some of the best known ladies and many of the most famous were quoted, with their advice to women and girls around the world. Biblical characters like Ruth, Esther and Hannah were looked at, but the main section was delivered by our own Dr. Jo Smith of Manchester University. She talked of the strength and determination of Emmaline Pankhurst and the suffragette movement in securing votes for women. Our prayers reminded us that it is a fundamental Christian principle that women should not be exploited and Jesus gave us clear guidance on this. 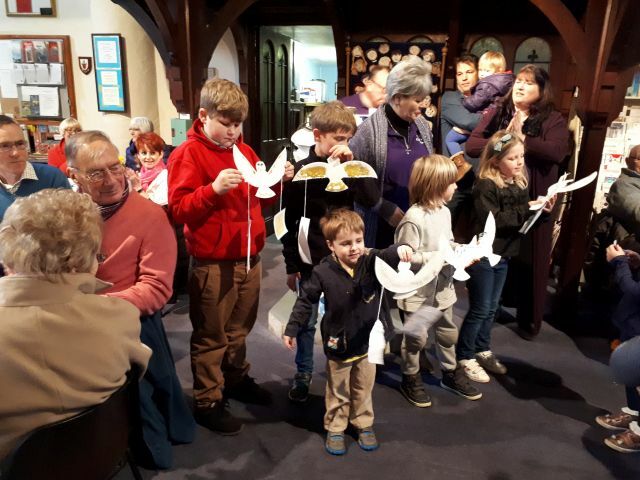 The service finished with the children, who had been making Mothering Sunday cards for their own Mums, distributing bunches of daffodils to all present. To all you mothers, have a happy day. The subject today was change and how we treat it. John told us about where we were up to with the proposed changes in the church interior, and there were poems by Lynn and Tim on embracing change. Everyone used the interval to talk of changes in their own lives, some of which was shared afterwards. The reading from 2 Corinthians talked of how belief in Jesus changes us and the children drew pictures of caterpillars and the butterflies they change into. 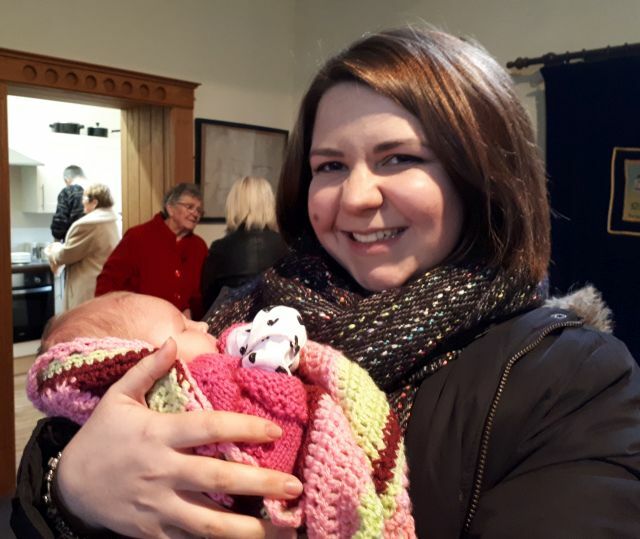 We were particularly happy with one change, when Hannah brought her new baby Sophie Grace to join us for the first time. 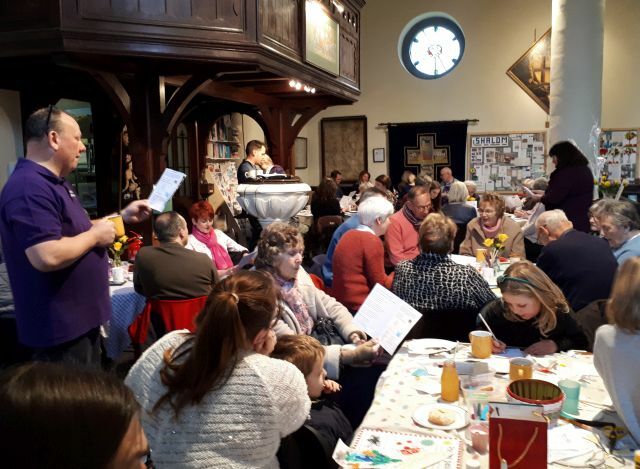 The first service of the year discussed The Trinity and it was bursting at the seams, with visitors also joining us from Runcorn, who were very welcome. There were readings and hymns as usual, but there was a film called The Trinity in Three Minutes, that explained the subject in a nutshell. A small play enacted how the relationship between Father, Son and Holy Spirit worked, concentrating on the Spirit and his role. Judy gave us a testimony and Lynn led prayers while the children made splendid doves and pictures. The coffee and cake went well and our thanks go to all those who contributed. rest of our planning group at our next meeting. 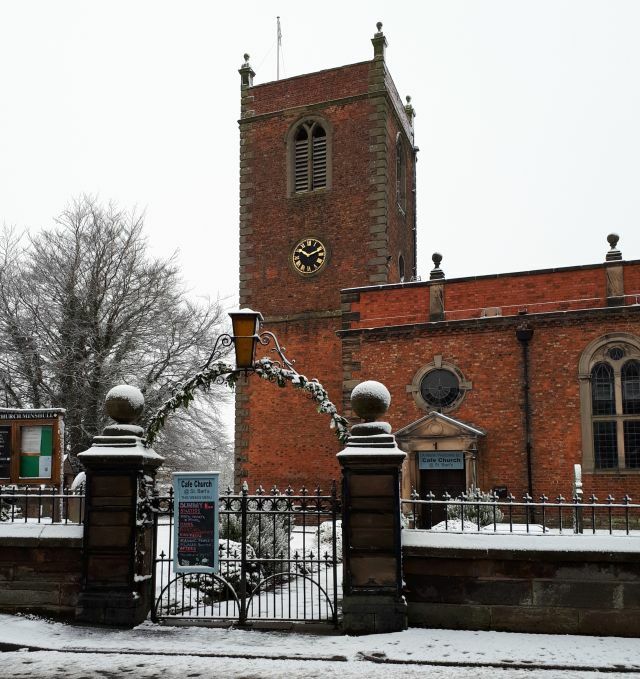 Today’s theme was Building Community and a good crowd braved the snowy conditions to hear about what the church and other village groups were doing to maintain the high standards we had set ourselves. 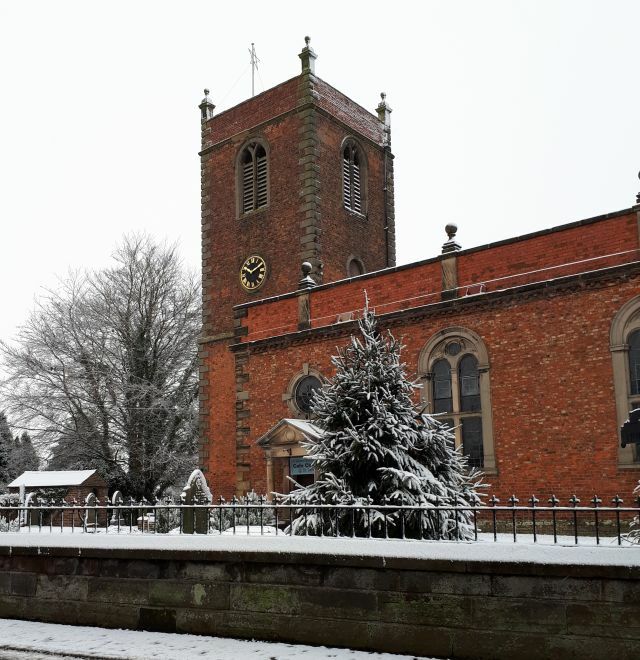 Now was no time to take for granted the two Community Spirit Awards the village had won and Dr Jo Smith talked about the work of the Parish Council to include everyone in village activities. After a quiz on village facts many spoke warmly of their welcome to the village and things that had happened to make them appreciate the warmth of friends and feel a sense of community. 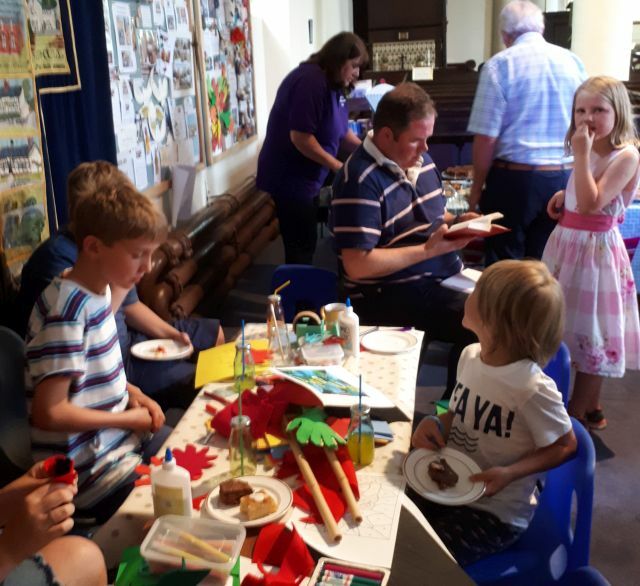 The coffee and cake flowed and the children drew pictures of village houses that were strung together to make a street scene. 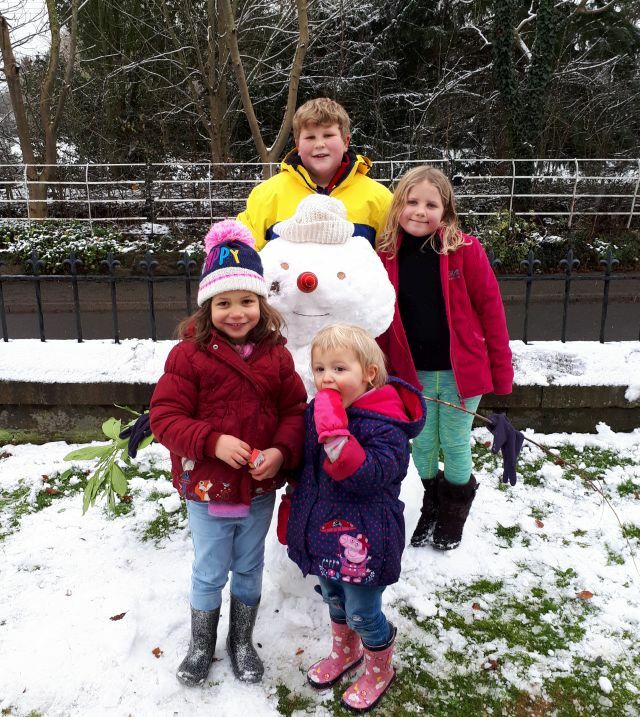 Then many went outside to play in the snow and after a raucous snowball fight some of the children built a snowman in the churchyard. 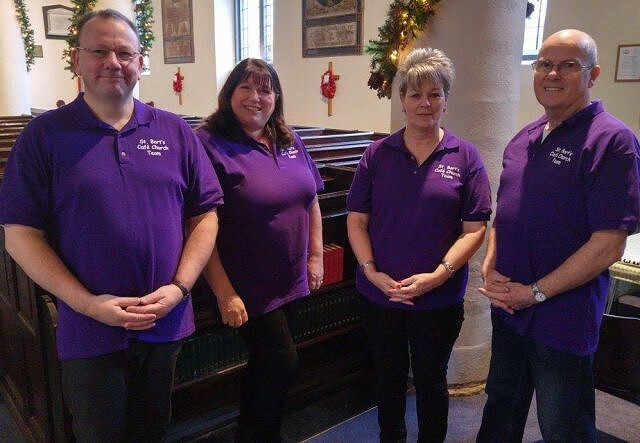 The Cafe Church Team were very touched by gifts of chocolates and a personalised comments book that were given to them to say ‘thank you’. A card filled with messages was also given to the team and they thank everyone for the wonderful comments they wrote in it. 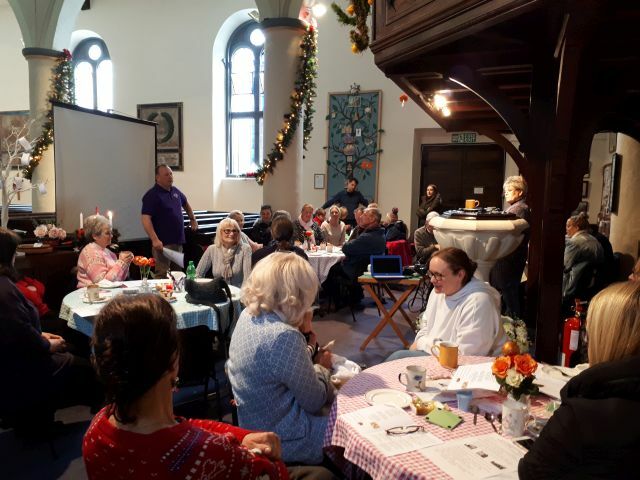 On Saturday 4th November we held a Cafe Church course in St Bart’s from 10.30am to 1.30pm. 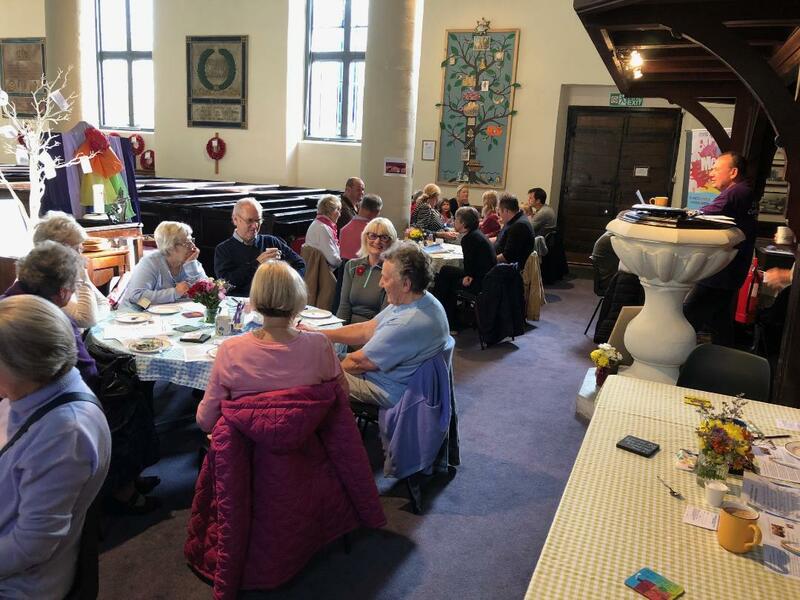 Due to the success of our Cafe Church, we wanted to share what we do with other churches in the Diocese who maybe struggling with decreasing congregations or looking at “Fresh Expressions of Worship”. 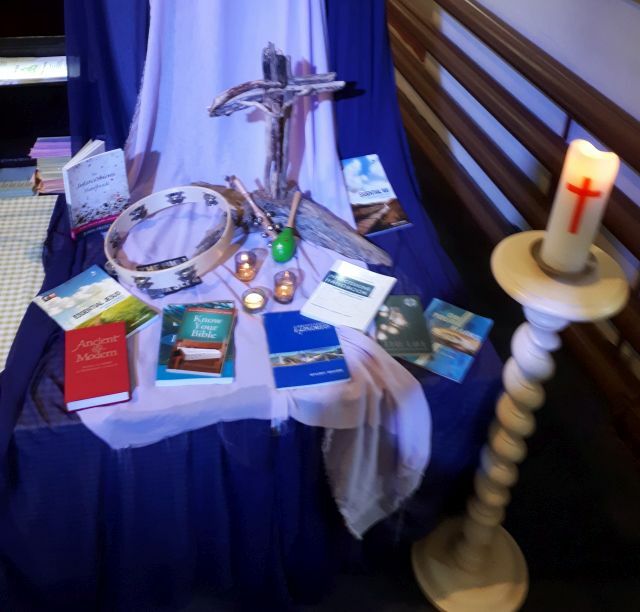 Every church in the Diocese was invited and we were pleased to welcome 17 delegates representing 10 churches from as far away as Meols on the Wirral and Macclesfield, plus more closer to home from Crewe and Sandbach. We also had the Diocesan Mission officer in attendance. It was the first use of our new projector which worked brilliantly! Oh! and lots of our delicious Cake and Coffees plus a Hot Pot lunch followed by Apple crumble and custard. So thanks to the 4 ladies from the congregation who helped with this. Thank you for the time yesterday at Café Church. It was inspirational and good to see it in practice. It is definitely something we at All Saints’ Crewe will be praying about and considering how to go forward. Today we discussed the colour of prayer and how colours can inspire prayer. There was a really difficult quiz on tghe meaning of each colour as stated in the bible. We finished with prayers for the World today, with all the disquiet and anguish that is currently familiar. 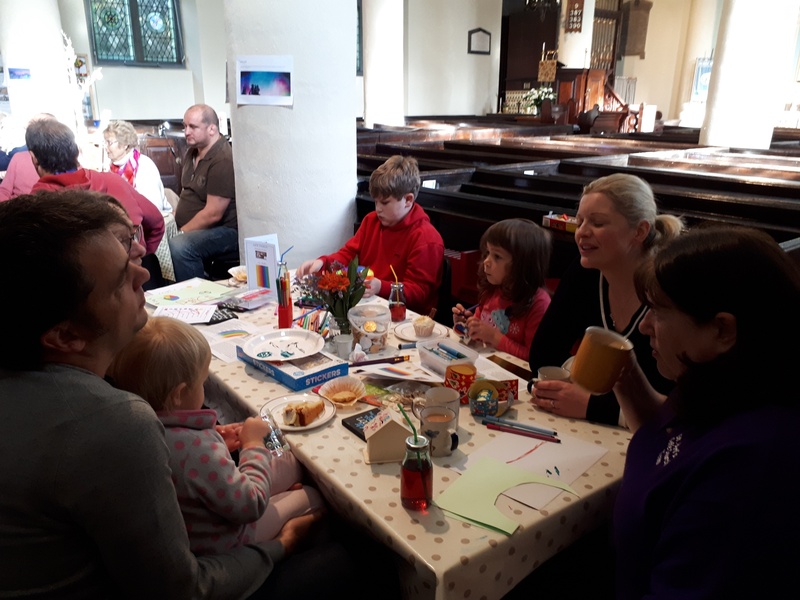 The children made good use of all the colours available on their table, to colour crosswords, treasure boxes and pictures, which they took home with them afterwards. On the ‘Good News’ side we were especially pleased to have Jes and Tom with us, who are getting married at St Bart’s on New Year’s Eve. We prayed for them to successfully prepare for their wedding and to have a blessed marriage to follow.